The highest levels of government are using ArcGIS Online to better inform decision making and more effectively communicate with the public. In addition to making ArcGIS a cornerstone of several important policy plans, the White House now frequently uses Esri Story Map apps to more clearly explain government issues. Likewise, a growing number of legislators in US Congress are using online web maps to communicate with constituents about matters that affect their districts. Over the past two years, Esri has partnered with the White House on several high-priority initiatives that use geospatial data to better understand complex issues and more comprehensibly convey their impacts to the American public. To help generate resiliency to climate change, Esri is supporting US president Barack Obama’s Climate Data Initiative, which uses open data and tools to facilitate better decision making. Spatial data and GIS visualization are key. The White House has partnered with Esri on several associated initiatives, including using GIS to help communities recover more quickly from natural disasters; make Americans more resilient to fluctuations in the food supply; encourage water conservation; investigate climate change impacts on ecosystems; and, most recently, see how climate change affects health. To encourage innovation and greater engagement on this front, Esri is sponsoring its second climate change app challenge that focuses on climate change and health. The goal is to help hospitals and health systems better anticipate, understand, and address climate impacts on community health. Esri is giving developers free access to open-data services and its developer tools. Esri is also participating in Obama’s recently launched Police Data Initiative, which entails having 21 American cities release 101 datasets on topics such as use of force and officer-involved shootings. The program seeks to use open data to strengthen police accountability, reduce police brutality, and ultimately rebuild community trust. To make this happen, Esri and the Police Foundation are building the open data portal the public can use to access this police information. GIS is also a central component of Obama’s ConnectED Initiative, which aims to improve learning and better prepare American students for the twenty-first-century job market by getting them to use state-of-the-art technology. With Esri’s donation of $1 billion worth of ArcGIS Online accounts, plus teacher training, to K–12 schools across the United States, geospatial thinking will become the norm for the next generation. The White House has embraced ArcGIS Online in its own work as well. Story maps made with Esri software populate various White House initiative websites, such as its page on rebuilding America’s infrastructure. The social media team also regularly uses story maps to explain complex policy issues, such as how American exports impact each state and the difference between two budget proposals. By giving these data-filled storylines geographic context, the White House’s story maps allow people to better understand how decisions at the highest levels of government could affect their everyday lives. 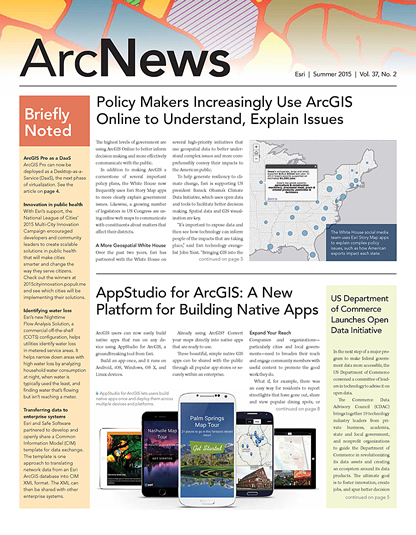 The White House is not the only federal government branch setting a precedent with GIS. 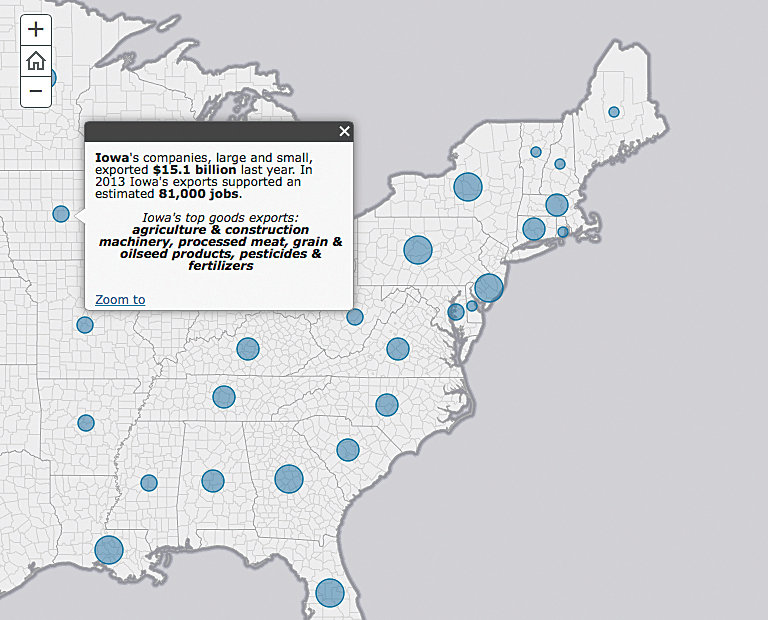 Congressional offices have begun employing ArcGIS Online more regularly too. Senator James Risch (R-Idaho), cochair of the GIS Senate Working Group, is a driving force in urging more government officials to use GIS. Risch has a robust ArcGIS software-based map gallery on his website that illustrates issues ranging from high school graduation rates and active wildfires across Idaho to projected state population growth. Other government leaders are incorporating GIS into their communication strategies as well. Senator Ron Wyden (D-Oregon), also cochair of the GIS Senate Working Group, supported his collaborative Better Care, Lower Cost Act by having his office use ArcGIS Online to show that many Medicare beneficiaries who suffer from chronic illnesses lack access to integrated models of care. The office of Representative Mark Takano (D-California) similarly used Esri software to show gaps in access to public transportation in the congressman’s district. And Senator Sherrod Brown’s (D-Ohio) office uses ArcGIS Online to develop and share maps on topics such as potential job gains across Ohio, structurally deficient bridges in each county, and locations where Ohio residents can safely dispose of prescription drugs. As the White House and members of Congress increase their use of GIS and, specifically, ArcGIS Online, decision makers and the general public will continue to gain a more comprehensive perspective on complex government issues. Learn more about how the ArcGIS platform can help inform and manage government activities at esri.com/industries/government.